Don't understand Google Wave, even after Google's helpful video and Lifehacker's review? 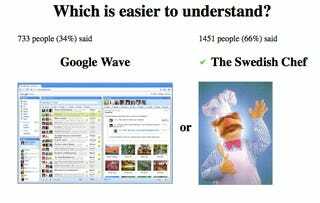 You're not alone: Some jokester created a site where users vote on how confusing Wave really is. Interestingly, while death is easier to understand, women are far harder.